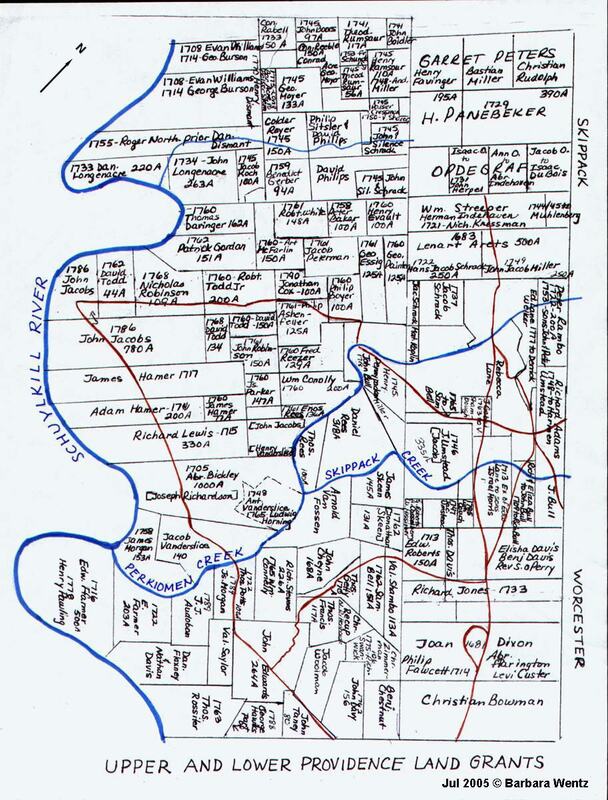 This map was enhanced by Barbara Wentz in 2005 using the data given in the lot numbers, and deed notes of the early Johnson and Bergey map in Genealogical Landmarks and Milestones of the Lower Perkiomen Country, published by The Perkiomen Region, Vol. XII, #3 & #4, October 1934, plus additions from sales and distribution of land found in Deed and Will Books of Philadelphia and Montgomery Counties. 1. 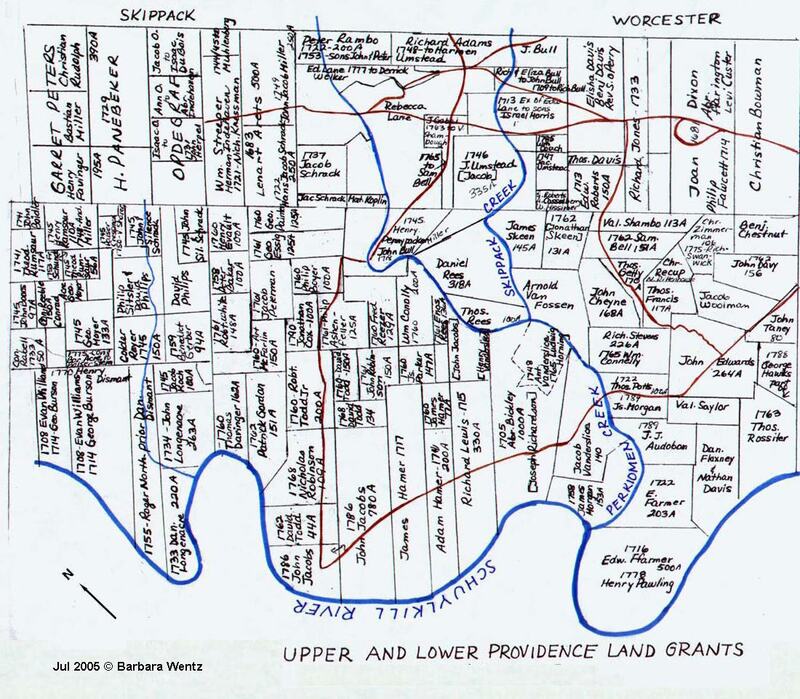 1722 Edward Farmer of Whitemarsh Twp., Gent., bought from Tobias Collett of London, Harbadasher, Daniel Quare of London, Watchmaker, And Henry Goldway of London, Linen Draper, a tract of 203 acres [part of their 5,000 acre tract sold to them by Wm. Penn, 1699] beginning at a hickory Daniel Flaxney's Line to a large Black oak, Then NW to Perkiomen Creek, then down the Creek to Henry Pawling's Land, then by same SE to the place of Beginning. Recorded 9 Nov 1753. History of land shows that the 5,000 acre tract was situate in, "the Mannor or reputed Mannor of Gilberts" beginning at a corner by the side of the Schuylkill River in the line of Isaac Norris's Land then NE by the sd. Norris's land 766 perches to a corner Spanish Oak, then NW by James Shattick's Land 990 perches to a corner Hickory of Skippack, NW 180 to a Spanish Oak by Perkiomen Creek, then down the several courses of the said Creek to River Schuylkill, then down the several courses of the River to the place of beginning. 2. 1 Dec 1738 Edward Farmer of Whitemarsh, Gent. sold to Thomas Morgan of New Providence , yeoman, 100 of his 203 acres. This land begins at a corner of a Chestnut by Perkiomen Creek and down the same to another Chestnut at a corner of the land granted to Morris Lewis, [part of the 203 acres...Morris was a signer of the 1736 St. James Petition. ], then by the same land 110 perches South East, then East 6 and 1/2 Perches to a Black oak, and then by the land of Daniel Flexney to place of beginning. Wit. Peter Robeson and Jno Durborow. Recorded 9 Nov 1753. 3. 26 May 1746 Thomas Morgan and wife Jennet sold the 100 acres to James Morgan (same metes and bounds as above.) Wit. Henry Pawling, John Edwards, Recorded 9 Nov 1753. Jennet releases land at that time, apparently Thomas has died. Elijah Davis and Rachel Pawling wit.